When I ask business leaders “why the things that need to be happening in the business either aren’t happening, aren’t happening fast enough, or are being done poorly” – the most common answer is “Apathy”. I can feel their deep sense of frustration, despair, and sometimes resignation that accompanies this word when it rolls off their tongues. It’s not surprising that business leaders feel this way, and give this answer. In many cases (not all), they’re working extremely hard, and spending a lot of money trying to motivate and engage themselves, and their people. They’re offering work life balance and wellbeing initiatives often with low levels of employee participation; they’re following “best practice” with change initiatives with a steady stream of communication and training so their people are informed and are technically capable; they’re putting their leaders through leadership training programmes; they have Kaizen and other continuous improvement and innovation programmes in place with little “buyin” or contribution; they have clearly defined purpose, mission and values;… and the list goes on of many things they’re doing that are to be commended. However, the end result remains the same – they’re just not creating the shift , the ROI, or the results, that they need or want. Isn’t it time we asked ourselves – what’s missing? Over the years,I’ve seen a huge amount of evidence to suggest that the missing link is our tendency to overlook the fact that people are essentially – well – human. We all have our own operating system, which is unique to us. We all have our own way of making meaning of the world, our own identity, perceptions, filters, beliefs, assumptions, fears, insecurities, immunities to change, ways of thinking, hopes and dreams. These define our capacity, motivations, limitations and possibilities. Without working at this highly personal level, the changes we want to see happen in us, our people, and our organisation will struggle to take effect, or make an impact. Despite this, most organisations continue to be primarily driven by an organisational perspective; and an “outside-in” approach; using a command and control; and “logic” based framework to drive progress and momentum, and trying to drive change from the top down. Even “best practice” solutions that look like they’re people-centric overlook some of the most basic of human traits. Consider as an example a widely respected and reputable change model which starts with increasing urgency. I haven’t found a better recipe for inciting overwhelm and stress, decreasing an ability to be resourceful and innovate, and putting people into the less than delightful, closed and insular state of fear. As another example… consider the “start with why” movement (of which I’m a raving fan). Even that has a piece of the puzzle that’s missing. The times I’ve facilitated the greatest impact have resulted from helping people identify their own personal “why”, and connecting the dots to align it with that of the organisation or project. It’s vastly more successful than employees just buying into the organisation’s “why”. When this is done employers and employees can see themselves as allies achieving more together than either of them ever could without each other. The real power lies in an “inside out” approach – shining the light on our internal world – understanding what makes us and our people think, act and behave the way we do. It lies in examining and shifting mindsets, developing new models of the world, new ways of thinking, exploring and challenging beliefs and assumptions. It opens the way to new possibilities, increased creativity and resourcefulness, enthusiasm, and caring. That’s why we at oAi are called on to work with individuals, teams and organisations to complement and boost their existing programmes, initiatives and projects; and achieve their desire for optimal performance and success. It’s understandable that you may think an inside-out and highly personal approach can’t be done in a cost effective and scalable way – but be careful that you don’t fall into the trap of making that assumption – because it can. And another beautiful and stunning thing about the inside – out approach is that it’s the only “mass” approach that actually works. What we all have in common is that we are unique. “Inside-out” bypasses and overcomes the limitations of approaches that magnify and address variation on the basis of generation, race and gender. Without the inside-out approach – the outside-in approach is like installing new programmes and files on an outdated or incompatible platform. It either doesn’t work, or performs poorly. It’s what keeps, us, our people, and our organisation where we are, or going backward. There’s only value in new programmes and files, if there’s the capacity and capability to run them. 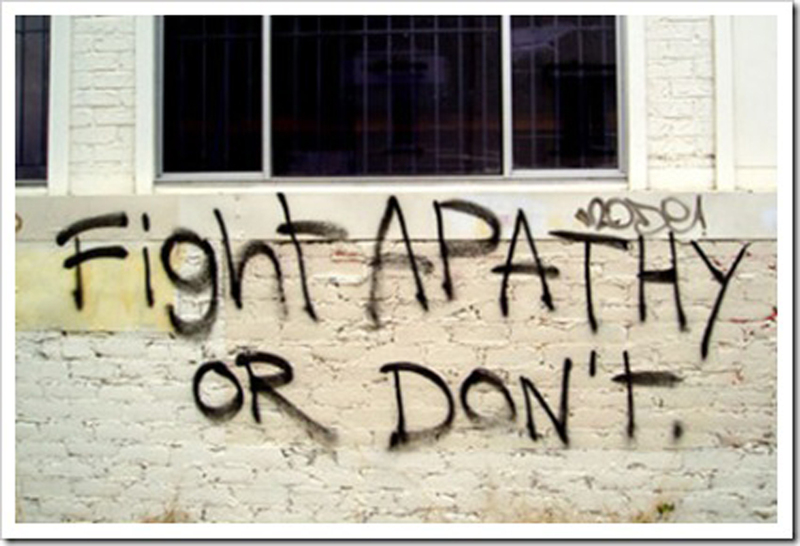 Apathy isn’t a cause – it’s a symptom. It’s a symptom of people not knowing themselves, feeling like they don’t really matter, that they can’t make a difference, and being blind to opportunity. In the words of Sir Ken Robinson – “people are only transformed if they’re engaged, and they’re only engaged if you look into their eyes and see how they work, and how they think, and how they’re involved.” Maybe the answer lies in evolving not only beyond the “organisation centric” model of the world, but also the “people centric” model – to a “person centric” approach.